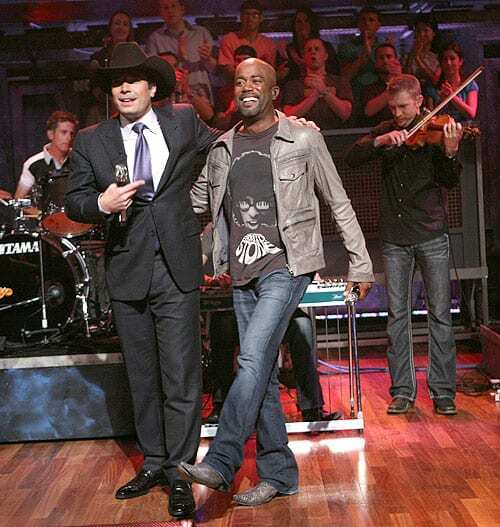 Darius Rucker performed on Late Night With Jimmy Fallon last night (4/25). While in New York City he visited the Today show yesterday, and the syndicated Wendy Williams Show, set to air today (4/26). He also played a benefit concert to fight homelessness and AIDS. The Capitol Records Nashville artist recently celebrated his fifth chart-topping single, “This.” It was co-written by Rucker, his producer Frank Rogers, and Kara DioGuardi. Rucker will be touring throughout the summer in support of his latest album Charleston, SC 1966. He will host the Darius & Friends Benefit Concert for St. Jude on June 6 in Nashville, as one of the events surrounding CMA Music Festival.